BRISTOL - After finishing the regular season in third place, the Bristol Blues will host the sixth place Pittsfield Suns in a first round playoff game tonight at Muzzy Field. 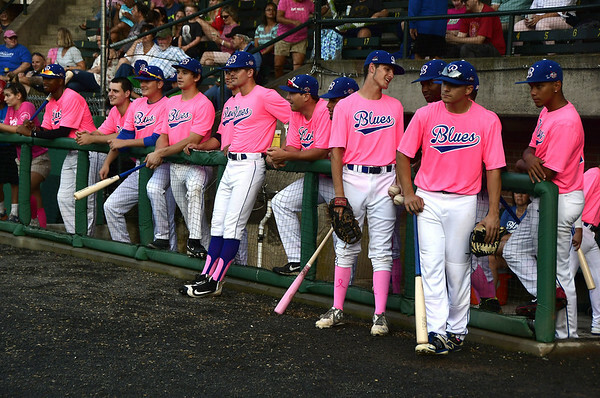 Entering the day, the Blues were faced with the possibility of potentially taking on a Silver Knights team that was the hottest in the Futures Collegiate Baseball League (FCBL), with an 8-2 record in its past 10 games, but a victory over Pittsfield last night dropped the Suns back into the sixth place position. Some members of the Blues expressed dismay over the possibility of their season ending after just one more game. The third place Blues entered the day 7½ games ahead of the fifth and sixth place Silver Knights and Suns. The playoff format is that six of the seven teams in the league get into the playoffs and the top two teams receive first round byes, while the third through sixth place teams face off in what are essentially play-in games. Adding to the frustration for some members of the Blues is that Bristol entered Sunday 6½ games behind the first place Martha’s Vineyard Sharks, showing that the No. 3 team is closer to the No. 1 team than the No. 6 is to No. 3. While Bristol will be in an elimination game to start the postseason, the Blues feel that they’re at the point in the season where anything can be thrown at them and they will respond. Posted in The Bristol Press, Bristol Blues on Sunday, 5 August 2018 21:48. Updated: Sunday, 5 August 2018 21:51.